I am raising fund for one broken family due to bank debt. Meghalaya in the North East India is a state, which you would have vaguely heard about because it rarely makes it to the news. Breathtakingly beautiful, this state was formerly a part of Assam and it became independent in 1972. It houses some of the most pristine forests in the whole of South Asia. This beautiful state was recently devastated by floods. In the flash-floods of September 2014, over 6 lakhs people have been affected. Lost lives, livelihoods and homes. Whole villages have been washed away taking away everything, there was. Those who survived the devastation are getting by on bare essentials. Our on-ground assessment teams have conducted surveys in the affected areas and found dire situations in several villages. Over 2656 families covering 6 blocks in West Garo/North Garo and South West Garo hills in Meghalaya are in great need of relief. However the roads to these areas are in bad condition and we have no support for airlift either. Hence, to provide relief to these areas, we have partnered with Bakdil (www.socialworkbakdil.org) and VHAM (Voluntary Health Association of Meghalaya), both well-respected and reputed organizations. They will procure supplies and essentials from local markets and distribute them to the flood-affected people. For this, we need your generous support. 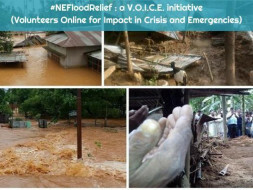 Your contribution can directly impact the lives of the flood-affected persons. Come forward, lend a helping hand and save a life!